Washington, DC–(ENEWSPF)–December 20, 2012. A preliminary version of Pest Prevention by Design, authored by Chris A. Geiger, Ph.D. and Caroline Cox of the Center for Environmental Health (CEH), was recently released by the San Francisco Department of the Environment (DOE). These guidelines, which will formally be released in mid-January of 2013, were created to help architects, engineers and builders to design and construct buildings that minimize the use toxic chemicals for pest control. This is accomplished by laying out comprehensive guidelines for building designs that prevent pest problems from taking hold. According to the authors of this report, “To our knowledge, no other comprehensive guidelines on pest preventive design tactics exists.” The San Francisco DOE is now exploring ways to pilot test the guidelines in various housing developments in San Francisco, and is hoping that these guidelines will be incorporated into various green building checklists, such as Leadership in Energy and Environment Design certification (LEED). These guidelines work to address the issue that pest preventive tactics are rarely included in a comprehensive way at the design stage of buildings. The authors point out that architecture, construction, facility management, and pest control companies are part of insular industries that have in the past rarely worked together to minimize future pest problems. The San Francisco DOE had the idea for these guidelines in 2005 when the department realized that it had stopped making progress in reducing the amount of pesticides used on properties managed by the city. The department concluded that part of its pest problem was the result of structural flaws that allowed pests to find their way inside. The city concluded that the fundamental design of these buildings was partially to blame. To write these guidelines, the San Francisco DOE organized an advisory committee in the spring of 2011 made up of members from a variety of different disciplines. The committee had pest control professionals, architects, engineers, pest management academics, green building experts, Integrated Pest Management (IPM) experts/consultants, and government employees working together on this subject. For a year, the committee held monthly meetings, and the discussion from these gatherings was incorporated into the draft guidelines. CEH was contracted to coordinate the project, and the guidelines were reviewed by the International Code Council. With a focus on prevention, the guidelines set out several general principles and provide additional detailed sections on improved pest preventive designs for different parts of building structures (i.e., roofs, windows, and doors). The first of the general principles emphasizes the importance of understanding local pest pressures. The guidelines’ authors argue that, “Architects, builders and engineers need not be entomologists or pest experts, but a rough familiarity with local structural pest species is essential in order to make the best design choices.” Different climate conditions intrinsically attract different types of pests. For example, pests are most troublesome in warm humid climates that speed up an insect’s life cycle. The physical space in which a building is constructed will also make a difference. To illustrate: constructing a building in an urban center, where subways provide a vast network of tunnels in which rodents travel, requires a different design approach than a building in a rural area. Additionally, the guidelines suggest that buildings be constructed so that they may be easily inspected. For instance, the guidelines indicate that built-in access to critical areas greatly assists pest management professionals in the early detection of wood-boring pests, potentially saving building owners thousands of dollars in wood replacement. The guidelines also account for tradeoffs, such as aesthetic or energy issues, that should be considered when designing a building that is more pest resistant. Beyond Pesticides is a strong advocate for defined structural IPM practices and is working to champion the use of these methods particularly in schools and hospitals, where vulnerable populations are at elevated risk from pesticide exposure. Beyond Pesticides’ Healthy Schools Project aims to minimize and eliminate the risks posed by pesticides through the adoption of IPM policies and programs at the local, state, and federal level, thereby fostering a healthier learning environment. Central to this effort are activities aimed at public education on pesticide hazards and the efficacy of alternatives, and the continued development of model communities that serve as examples. Beyond Pesticides also believes that hospitals have a special obligation to demonstrate leadership in instituting effective and safer pest management in order to advance the medical profession’s basic tenet of “first, do no harm.” Beyond Pesticides, along with the Maryland Pesticide Network (MPN), has worked with several health care facilities in Maryland to transition towards IPM practices. 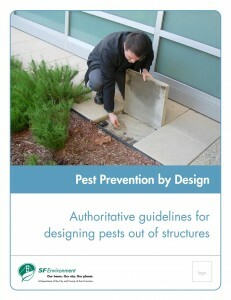 If you would like to be notified of the formal release of Pest Prevention by Design and receive a copy of these guidelines, sign up here. For more information on structural IPM, please visit Beyond Pesticides’ “What is Integrated Pest Management (IPM)?” page. If you would like to know if there are Pest Management Service providers that use IPM and least-toxic practices, visit Beyond Pesticides’ Safety Source database..